I have had an opportunity to review the performance of my Autolumination brake flasher unit, and wanted to update my opinion on this product. Earlier this year, I set out to install a brake flasher on my LX-150. Why? Having been rear-ended in my car, I wanted to take extra steps to prevent the same from happening while on my Vespa. Having reviewed the various posting on MV, it seemed that most riders who installed brake flashers used either the Comagination or Autolumination versions. The Comagination version needs to be wired into the electrical system. The Autolumination version is a replacement bulb. Wiring in a modulator is not terribly difficult. 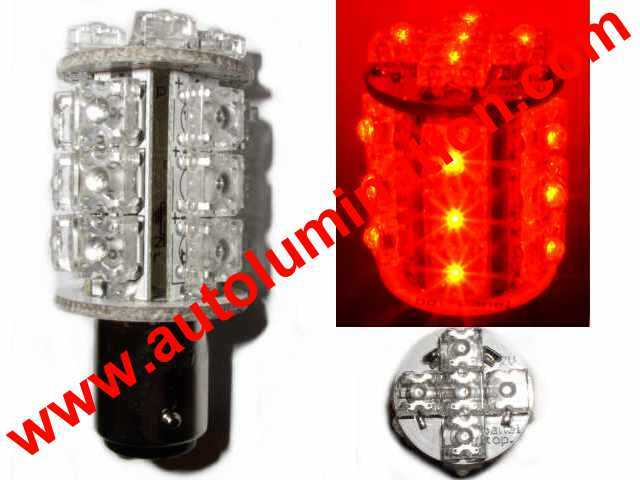 However, I wanted to minimize the installation, so chose the Autolumination bulb. - LED rear brake doesn't work on ET4 -- why? - variable voltage causing bulb to fail? I contacted the company by email, and was informed that I could return the nonfunctional bulb for inspection, and would receive a refund (less 20% restocking fee). I returned the bulb, only to learn several weeks later that I would not be sent a refund, since the bulb was only warrantied for 30 dayas from the date of purchase. This was news to me. I explained that while I purchased the bulb in January, and had only been able to install the unit, and start riding in April when the snow melted. More over, not only was I missing my bulb (which I had returned to the company) but now I had invested the additional postage cost of returning it. The company agreed to a one-time replacement of the bulb. The assessment of Autolumination was that the bulb failed because of variation in my LX150's voltage. They recommended that I install an LED protector (voltage load equalizer) which they sold for the reasonable fee of $1.99. I ordered that, and wired it into my tail light assembly. This seems to be the fix for the problem I originally encountered. After two months, and 1000 km of use, my Autolumination braker bulb continues to work as intended. Am I satisfied with this product? It seems to work well now, and I intend to monitor it over time. Some other MV members have raised concerns that the use of a battery tender will cause the bulb to fail, but I have not noticed this (yet) with mine. I do keep my OEM brake bulb on the scooter, just in case! (1)The original goal was to install a reasonably priced brake light flasher without having to modify the electrical wiring (as needed for the Comagination version). At $19.99, the product was reasonably priced. However, in the end, I still had to wire in the load equalizer, so that goal wasn't met. Once you add in the additionall $1.99 for the load equalizer, I was near the cost of the Comagination product. (2)The company should make it clear on their product page that a load suppressor may be necessary. 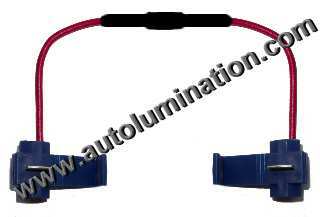 Trying to locate the product on the Autolumination web product page is challenging. They would do better to include the load equalizer with the bulb, and incorporate the $1.99 into the total cost. (3)Correspondence with the Autolumination was not satisfactory. I don't agree with charging a “restocking fee” when one is returning a defective or non-working product. Worse, I learned after the company had received the bulb back, at my expense, that they were not going to provide the partial refund promised. I do not believe that one should have to go to the extent that I did to receive a replacement product. I do recommend the use of a brake light flasher. But if not the Autolumination, what other product could one choose? The Comagination brake flasher has generally received positive comments, and is reasonably priced at $24.95 to $28.95.. As well, Kriss makes a brake flasher unit that is compatible with the LX, GT and GTS modern Vespas for $89.95. Both require some splicing into the electrical system. I have learned, however, that wire splicing is pretty much unavoidable. I was looking into the model based on someone's review/cost and so forth for a quick, cheaper safety mod on my bike! Now...well it's obviously a bit more involved. Thank you for the relevant links to the other threads here as well as the other options for brake light flashers! If you are referring to wiring in the flasher, the ones that I mentioned are a simple splice into the brake wire. I hadn't done it before, but (believe me) if I could do it, anyone can do it! We can't legally use flashing lights in the UK, but i liked your review. The company sounds a bit suspect though. How could they charge a "re-stocking fee" for a defective product. Surely if they put it back into stock, they are going to sell it to another person faulty. They could then charge them a restocking fee. Wait a minute, great plan. I'm off to set up a shop selling faulty stuff!! I wasn't real happy with the customer service I received. But to the company's credit, they did send me a one-time replacement in the end. What really bothered me, though, was that the whole problem with my bulb's failure - and I suspect the problems experienced by others on MV - could have been avoided with some indication that the voltage load equalizer was necessary. If you visit the company website, there is nothing to indicate this, unless you happen across the page with the load equalizers on them! All the same, if Autolumination had indicated that splicing in a load equalizer was necessary, I would have bought the Comagination unit. The damn flasher bulb failed on me again! This time, it appears to be due to the failure of the load equalizer. Temporarily running a wire around the load equalizer returned the brakes to their normal working condition. I ended up removing the load equalizer, tossing the bulb in the garbage, and just splicing the original brake wire back together. With this new problem, I cannot recommend this product to anyone. Please, consider the alternative that I have listed above. Go with the Comagination kit for the headlamp modulator (plug and play) as well as the brake lamp module (splicing, which you have already done). You won't have the LEDs but I've found the OEM bulbs are brighter over a broader range. I have had my Comagination units operating flawlessly for a year now. No equalizers, or any other bull-roar necessary. BTW, the headlamp modulator has saved my bacon on many occassions. I do appreciate the headup on this product, which I've got. So far [knock on wood], mine is still functioning properly. I travel w the stock bulb in the pet carrier just in case. . . Thanks for all the info folks...head and tallight modulators are next for me on the project list. Go with the Comagination kit for the headlamp modulator (plug and play) as well as the brake lamp module (splicing, which you have already done). Thanks, I have had the headlight modulator installed last winter, and the brake flasher is sitting on the shelf. No excuse now not to install it. Who makes the headlight modulator? Comagination http://www.comagination.com/. Eesy-peesy plug and play! You can buy either the headlight modulator or the brake flasher separately, or a combo. Comagination http://www.comagination.com/ makes a California legal brake light flasher. I installed one 9 months back and it was an easy install and works great. Black wire is ground. This module works with Incandescent Lighting, LED Lighting or a combo of both! Create more visibility and conspicuity when you are stopped or stopping when you install the BackOFF-XP™. Emit a visual signal of 4 short light flashes, followed by 1 long light flash (3.5 seconds). The signal automatically repeats itself as long as the brakes are applied. This pattern is not random, but has been selected because of its ability to retain following drivers attention. Emit a visual signal of 5 short flashes, followed by a steady on light that remains steady on as long as the brakes are applied. Motorcycle Emergency Flasher or Automobile Back-Up Flasher. Most states drivers handbooks recommend that you flash your brakes when slowing or stopping. The BackOFF-XP™ automatically facilitates compliance and enhances safety. Install the BackOFF-XP™ and see how much more effective your brake light can be. Easy Installation. - Simply install the BackOFF-XP™ Module in line with the brake light wire leading to the brake light and connect a ground wire. Large power capacity: - 12 volts DC, Maximum Capacity 10 Amps! Sealed Weather Resistant heat sink case. Limited Warranty - One Year! +1, I've used the "Back Off" on several motorcycles, never had a failure, easy install. Can you tell me which wires you wired the LED protector (voltage load equalizer) to your rear light? I have three wires going into my rear light bulb sockett and have tried wiring all possible combinations and nothing has worked yet. Thanks for your help/advise. pd.